Like all religious thinkers, Kierkegaard places in the centre the question: How is human existence possible? All through the Nineteenth Century this question – which before had been the core of Western thought – was not only highly unfashionable; it seemed senseless and irrelevant. The era was dominated by a radically different question: How is society possible? Rousseau asked it, Hegel asked it, the classical economists asked it. Marx answered it one way, liberal Protestantism another way. But in whatever form it is asked, it must always lead to an answer which denies that human existence is possible except in society. Rousseau formulated this answer for the whole era of progress: whatever human existence there is; whatever freedom, rights, and duties the individual has; whatever meaning there is in individual life – all is determined by society according to society’s objective need of survival. The individual, in other words, is not autonomous. He is determined by society. He is free only in matters that do not matter. He has rights only because society concedes them. He has a will only if he wills what society needs. His life has meaning only in so far as it relates to the social meaning, and as it fulfils itself in fulfilling the objective goal of society. There is, in short, no human existence; there is only social existence. There is no individual; there is only the citizen. 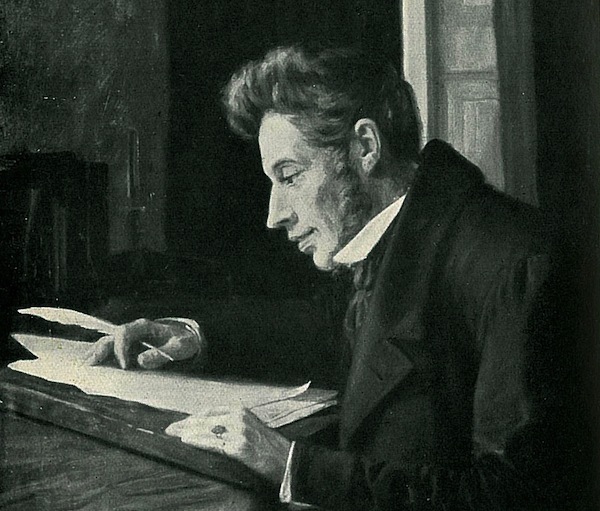 In eternity, however, in the realm of the spirit, “in the sight of God,” to use one of Kierkegaard’s favourite terms, it is society which does not exist. In eternity only the individual does exist. In eternity each individual is unique; he alone, all alone, without neighbours and friends, without wife and children, faces the spirit in himself. In time, in the sphere of society, no man begins at the beginning and ends at the end; each of us receives from those before us the inheritance of the ages, carries it for a tiny instant, to hand it on to those after him. But in the spirit, each man is beginning and end. Nothing his fathers have experienced can be of any help to him. In awful loneliness, in complete, unique singleness, he faces himself as if there were nothing in the entire universe but him and the spirit in himself. Human existence is thus existence on two levels – existence in tension. St. Augustine had said that time is within eternity, created by eternity, suspended in it. But Kierkegaard knew that the two are on different planes, antithetic and incompatible with each other. And he knew it not only by logic and by introspection, but by looking at the realities of nineteenth-century life. It is this answer that constitutes the essential paradox of religious experience. To say that human existence is possible only in the tension between existence in eternity and existence in time is to say that human existence is only possible if it is impossible: what existence requires on the one level is forbidden by existence on the other. For example, existence in society requires that the society’s objective need for survival determine the functions and the actions of the citizen. But existence in the spirit is possible only if there is no law and no rule except that of the person, alone with himself and with his God. Because man must exist in society, there can be no freedom except in matters that do not matter; but because man must exist in the spirit, there can be no social rule, no social constraint in matters that do matter. In society, man exist only as a social being – as husband, father, child, neighbor, fellow citizen. In the spirit, man can exist only personally – alone, isolated, completely walled in by his own consciousness. Existence in society requires that man accept as real the sphere of social values and beliefs, rewards and punishments. But existence in the spirit, “in the sight of God,” requires that man regard all social values and beliefs as pure deception, as vanity, as untrue, invalid, and unreal. Kierkegaard quotes from Luke 14:26, “If any man come to me, and hate not his father and mother, and wife and children, and brethren and sisters, yea and his own life also, he cannot be my disciple.” The Gospel of Love does not say: love these less than you love me; it says hate. To say that human existence is possible only as simultaneous existence in time and in eternity is thus to say that it is possible only as one crushed between two irreconcilable ethical absolutes. And that means (if it be more than the mockery of cruel gods): human existence is possible only as existence in tragedy. It is existence in fear and trembling; in dread and anxiety; and, above all, in despair. This seems a very gloomy and pessimistic view of human existence, and one hardly worth having. To the Nineteenth Century it appeared as a pathological aberration. But let us see where the optimism of the Nineteenth Century leads to. For it is the analysis of this optimism and the prediction of its ultimate outcome that gave Kierkegaard’s work its vision.